Harlem Désir is currently a socialist politician and Foreign Affairs Under-Secretary for Europe in the government of French Prime Minister Manuel Valls. His career began in the 1980s when he was a leftist student who protested racism and the leader of “Touche pas à mon pote.” Désir was born in Paris in a left oriented family: his Martinique-born father was a communist school master and his mother from Alsace was a specialist in infant welfare and a union member. After attending school in Bagneux, Désir graduated in 1983 from the University of Paris (Pantheon Sorbonne) in philosophy. While a student at the Sorbonne he was leader of the Student Socialist Union (UNEF-ID). Despite such praise, the political career of Harlem Désir did not fulfill all the promises of SOS Racisme. As he grew older he gravitated toward the French Socialist Party and in the process lost many of his most fervent supporters. When he left SOS Racisme in 1992, Désir briefly joined Generation Ecologie, a new party which many on the left felt was engineered by President Francois Mitterand to divide the French Green Party. He failed, however, to be elected a deputy to the French National Assembly under the Generation Ecologie banner in the 1993 national elections. Returning to the Socialist Party, Désir was appointed to its national board in 1994. He campaigned again for a seat as a deputy in the National Assembly in 1997 where he would have represented a heavily immigrant suburb north of Paris but was beaten again in the general election. Two years later he won election to the largely ceremonial European Parliament. In 2004, Désir was chosen by Socialist Party leaders to represent the district surrounding the Ile de France. Four years later he was elected vice president of the European Socialist Party. He was reelected in 2009. Although Désir tried to advance the ideas of the Socialist Party in the European Parliament, he has, according to most political observers, not been particularly politically active in that body. As with many French representatives in the European Parliament, he was not concerned about European political affairs, was frequently absent, and made very few proposals. Désir remained active the Socialist Party. 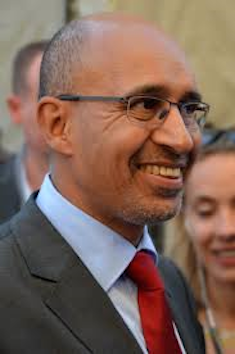 In 2008 he became the Coordination Secretary of the Party and in June 2012, following the election of Socialist François Hollande as French President, Désir became president of the Party. On April 9, 2014 he was nominated by the Socialist Party as Secretary for European Affairs. Harlem Désir, De l'immigration à l'intégration: Repérages (Paris : Acte Sud, 1997); Harlem Désir, Pour la république sociale: La gauche socialiste dans ses textes (Paris : L’Harmattan, 1997); Harlem Désir, D'où je viens, où l'on va (Paris: Jean-Claude Gawsewitch, 2010); Thomas Ferenczi, Chronique du septennat: 1981-1988 (Paris : La Manufacture, 1988); Éric Raoult, SOS Banlieues (Paris: L'Harmattan, 2000); Guillaume Sainteny, L'introuvable écologisme français (Paris: Presses universitaires de France, 2000).